Suffering from a leaky, troublesome flat roof? Simply get in touch for a free quote today and see what ClassicBond can do for you. 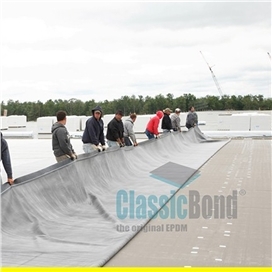 When you need a sustainable, long-lasting rooftop, look no further than the single-ply membrane with a half-century track record of performance and durability - ClassicBond... the original EPDM. We stock all roll sizes and normally the advanced EPDM membrane can be cut to the size required for your roof. More than 10 billion square feet of membrane have been sold. No other manufacturer has a comparable track record. Suitable for a whole host of residential and commercial roofing applications, including green roofs, ClassicBond is the roofing membrane of choice for many.